Martial Views: Lights, Camera, Action! Asian immigrants and post second World War US servicemen returning from overseas were the first exponents of martial arts in the West. But only when the martial arts were depicted on the silver screen and in television did they explode in popularity. Mr. Moto and James Cagney's Blood On The Sun featured early portrayals of some slick judo action in movies. 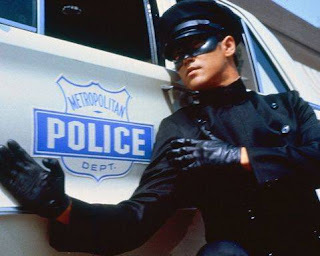 Later, when Bruce Lee's character of Kato on TV's The Green Hornet first aired, it was just the beginning. The viewing public had never seen such acrobatic martial mayhem before. The role of Kato was the perfect showcase for Lee's talents, as he began to teach a prototype of his jeet kune do to Hollywood's elite. The normally secretive Chinese community were extremely displeased with Lee's open teachings of what they perceived to be "their" martial arts, but Lee himself saw his road to success in the film industry. Lee's contributions may have helped set the stage for the popular weekly 70s show Kung Fu. The role of the wandering Kwai Chang Caine was a first; the martial arts were presented in a character who was deeply philosophical and the series was curiously set in a late nineteenth century Old Western background. Kato, Billy Jack, et al, though they were cast as the good guys, left little doubt that fighting fire with fire took precedence over ethereal flashbacks to Shaolin temple anecdotes. Nevertheless, Caine always delivered one or two memorable fight scenes per episode. Cowboys and kung fu made for an entertaining and very interesting mix. Comedy has found its way into the most unlikely subjects in movies and TV (remember Hogan's Heroes?) and the martial arts were not to be excluded. Jackie Chan was trained in Chinese opera as a child and was later influenced by silent movie legend Charlie Chaplin, which led him to create a genre of movies that combines martial arts, humor, and spectacular stunts - mostly performed by Chan himself. Chan has been called the Evel Knievel of martial arts for the myriad of stunt related injuries he's incurred through his years of movie making. While Crouching Tiger, Hidden Dragon has been hailed as a milestone film, on the opposite end of the spectrum we have the likes of A Fistful of Yen - a parody of Lee's classic Enter The Dragon which concludes with the same closing scene from The Wizard of Oz! Columnist and author Dave Barry once remarked "karate is a form of martial arts in which people who have had years and years of training can - using only their hands and feet - make some of the worst movies in the history of the world." I wonder if Barry has ever seen the epic Kung Fu Hustle? These also had some extreme fighting seens as well as humor. Heh - my husband bought something called "The Classic Martial Arts Collection" about six months ago. Fifty martial arts movies for $12, which should be a hint about the quality involved. No Bruce Lee or Jackie Chan, but lots of flying feet largely accompanied by somebody in the background saying "Bam! Pow! ", or in one case "Crunch!" A living illustration of Dave Barry's point. Kung fu hustle. I loved that one. Fist from the heaven. Thankfully, movies have evolved. Once you realize that you can't actually fly, the artistic note of most movies is quite fun. Although, as in "house of throwing daggers", the poetry takes over everything and you end up with a so-so movie. I have to agree with M.Barry. Most movies are crappy. I remember bloodsport. M. Frank Dux and Chong Li. Those where nice at the time. I have fond memories of the Green Hornet, but it was Kung Fu that got me interested in martial arts in the first place. 50 movies for $12? Not bad. Actually the real entertainment to be found in these bad martial-art flicks isn't the action, but the incredibly bad dubbing! Chong Li! That's Bolo Yeung. He played the heavy in a number of movies. He only practices tai chi these days - can you believe it? I really enjoyed those Kung Fu episodes. I remember a number of Chinese style schools opening up everywhere during that time - a testament to the popularity of that show. The dubbing in most martial arts movies is abismal. I recently watched "Fearless" and we put it on the dubbed setting. The thing that always cracks me up is their laughs. They're so exaggerated, like "HA. . . HA. . . . HA". Too funny. "He(bolo yeung) only practices tai chi these days - can you believe it?" I have seen most of his movies. He really looked like a badass! Yep, I can. I'm considering switching myself. Although I love the external type workout, I really enjoy the benefits and well-being that comes with internal/soft styles. You can start anytime with very limited warmup, there are almost no injury related to taichi (in fact, are there???) and you can do it while waking up. For now, I'm enjoying the combo very much. Chi kung/karate. I admit it's strange for a former bodybuilder to do so. But M. James from isshindo.blogspot.com is a former bodybuilder too. Have you seen the latest Tony Jaa movie "The Protector"? This guy is off the charts in his stunts! All of them are done without cables. Without a doubt, the funniest dubbed movie I ever saw was Hercules In New York - Arnold Schwarzenegger's first movie. In it, Arnold's voice is dubbed by somebody that sounds like Darth Vader! I've given some thought to tai chi. Everyone seems to think highly of it. I'll switch over myself eventually. Tony Jaa? Sorry, I've never heard of him. I'm going to assume he does most of his own stunts like Chan. But thanks for the info - when I get a chance, I'll check him out in a search engine. Karate Kid came out after I got into Taekwondo, but it was very close to my heart, as the entire reason for me starting the martial arts was the daily beatings I took in the 6th grade. Of course Bruce Lee movies were big for me as well, but I must have watched Jackie Chans "The Big Brawl" about 10,000 times, I watch Sho Kosugi quite a bit as well. Much later "Best of the Best" moved up my favorites list. I recently Read Jackie Chans Auto-Biography "I am Jackie" I thought it was fantastic, and really eye opening not only about Jackie Chans life, but about the birth of the "Kung Fu" movie. Recently: District B13 was cool, "Curse of the Golden Flower" was good although not much martial arts. "The Protector" and "Fearless" are in the queue! The Karate Kid drove many to the martial arts, and not just kids from what I understand. The Big Brawl - I remember that one! Most people don't realize that Chan, at one time (maybe still is), was a successful recording artist in the East as a vocalist. Sho Kosugi - the ninja guy. Those ninja flicks were huge in the early 80s. I think Best of The Best was based on a true story. Eric Roberts was in that one I believe (he never did approach the popularity of his more famous sister). Hmm... another Tony Jaa fan. My co-workers rave about his movies too. Everybody's heard of this guy but me!